I truly cant believe that I am still pregnant!! My whole pregnancy I had a feeling that I would have her early. This lead me to end work earlier than planned and make a few other choices that I am now regretting :( Our unborn child is already teaching me that I cant plan everything as much as I would like to. 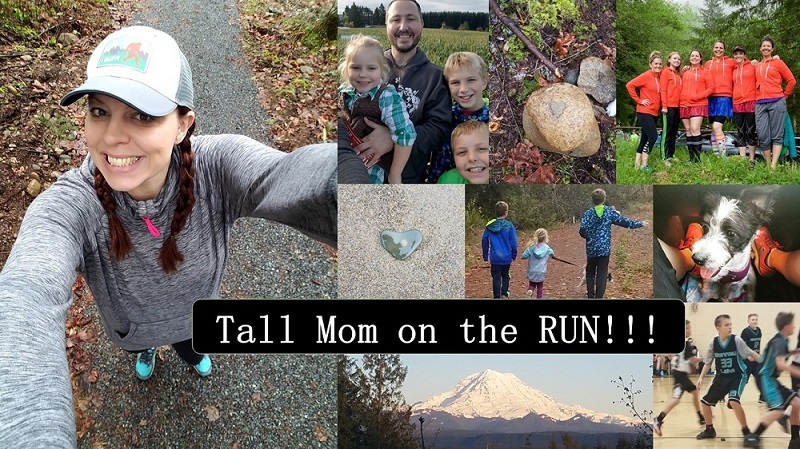 On my due date we had scheduled an elective induction, I made this decision for a couple reasons but it really came down to childcare for the boys and not taking more time than necessary off of work. The plan was that the hospital would call after 5am on Monday 7/22... We dropped the boys with Tall Grandma the night before and settled in, both Muscle Man and I hardly slept. 5am came and went.. WAITING!! WAITING!! I called the hospital at 6:45am, they said I was second on the list and that they were very busy..
We sat around the house ALL DAY waiting for the call. This was SUPER frustrating!! I called my Dr's office and the hospital again. Finally around 3pm they said we could come in at 7pm. Having been away from the boys all day we went to visit them for a while. Got checked in at the hospital and had the first TINY dose of Cytotec at about 9:30PM. It did nothing! Tall Sister, Muscle Man and I did what we could to pass the time. Eventually we settled in to sleep. I got the second bigger dose at about 1:30AM and thought for sure it would do something.. It didn't!! Baby's heartbeat was good so I tried to sleep more. Seemed like we waited forever for the next step. They began Pitocin the next morning. Again NOTHING!! Wow!! I could not believe that I was feeling no contractions. I had read a lot about inductions and the risks, etc. but nowhere did I recall seeing that it may not work. At about 1:30PM I was starting to think that we should stop, clearly baby was not ready.. There was some confusion on who my nurse was as one had gone to lunch...they called my Dr., a lady came in with the table for delivery?!?! I found this very annoying, we were trying to decide if I was going home and someone brings in the delivery stuff, UGH!! My Dr. had the Dr. on call come in to check me. The Tall strong gal started talking about breaking my water, which I was TOTALLY against, I had not had one real contraction, there was no way I was going to let her do that. After checking me it was clear that baby girl was not moving toward the station to be able to deliver. We all decided it was time for me to head home. We had to wait 1 hour and monitor the baby while the Pitocin left my system. I felt horrible guilt for putting my body and baby through all of that. I started crying and could hardly stop. We headed home about 3pm. That was Tuesday, now it is Thursday and I am not feeling great. My body went through a lot so it is hard to tell if I am still recovering from that or if this is the early stages of real labor. Time will tell. 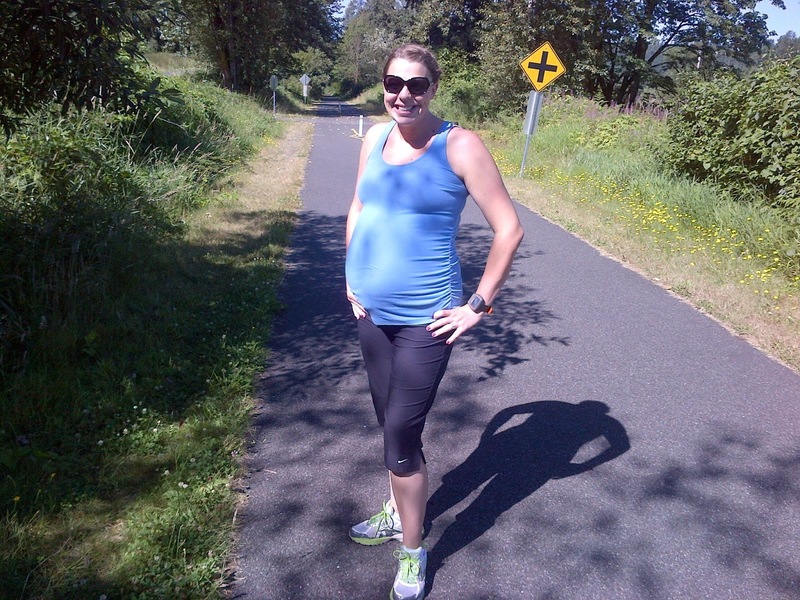 Miles Walked Pregnant: I have not walked much, have heard mixed things about walking. Right now it is painful so I am resting mostly. Weight Gained: 33 pounds total. Which is amazing!! Current Cravings: the only thing that sounded good when we left the hospital was KFC boneless wings, they tasted AMAZING. I also am loving Velveeta shells and cheese macaroni. Current Aversion: Nothing really, but also not much sounds good. Baby Likes: Baby girl likes it when I lay on my left side, this was very clear in the hospital when I was on the heart rate monitor. I told the staff that she would calm down once I switched positions and it worked. Baby Dislikes: At this point I think she dislikes getting into position to be born. Gripes: Hormones. Feeling Guilt for my decisions. Failed induction. Feeling judged. Going past my due date. Purchases: Gifts from the baby to her big brothers for in the hospital. So there you have it. Due date +3 and not sure when baby will come into the world. In case you are curious we have tried SEVERAL natural induction methods. Thanks to everyone for the well wishes! Will keep you posted. 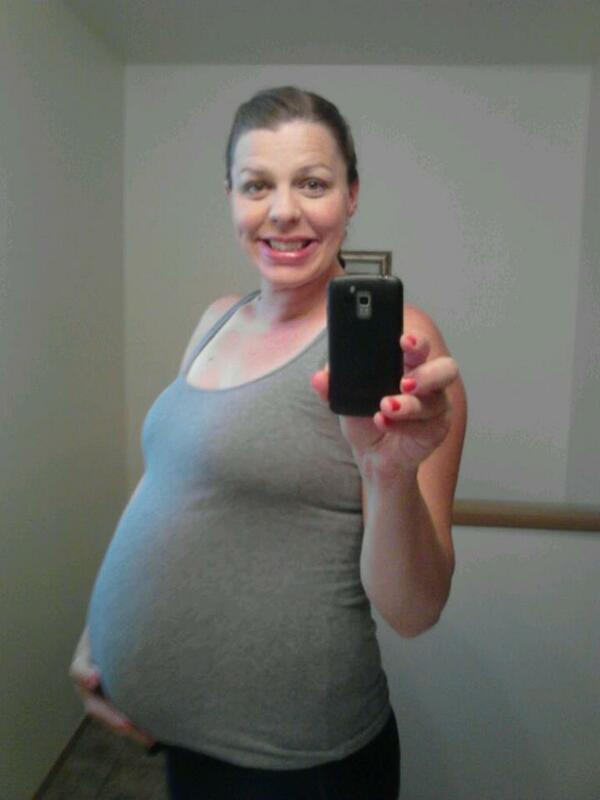 At 39 Weeks Pregnant yesterday it has been a bit CRAZY since my last post. For those of you who follow me on Facebook HERE, you already know that at my 38 week apt last Wednesday the Dr. discovered that our little wiggly baby had moved from her head down to a breech position!! This was not even a worry in my mind, she had been head down since week 32. So I went home with some exercises and a plan to go to hospital for what I called the "flip appointment." All weekend I did the exercises, walked and prayed. I was at peace with whatever had to happen. Tall Grandma took the boys on Sunday night so Muscle Man and I could get to the hospital at 7am. When we arrived they quickly hooked me up and my Dr. started the ultrasound... Her head was back down and I got a glimpse of her cute little cheeks!! What a relief. We spent more time completing the discharge papers than the actual apt. 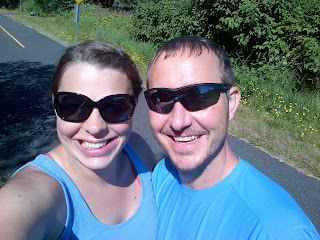 Since it was still early we went home, had breakfast, took a little nap, then went for a 2.5 mile sunny walk. It turned out better than I had hoped for, hope she keeps that head down. Miles Walked Pregnant: I have lost track, I think I am at 175. I plan to walk a lot this week to help get things MOVING toward meeting our baby girl. Weight Gained: 32 pounds and holding. I am proud of this number and feel very fit. Baby Likes: Baby girl likes it when her Daddy and brothers talk to her, she calms almost immediatly. Baby Dislikes: Sleeping!! Hehe.. She has been moving in the middle of the night, making it a little tough for me to sleep. Hopefully this is not a preview of what is to come. Excitement: Being done with work and knowing that we will meet our baby girl in about a week!! Gripes: Not knowing when she will come and feeling like I am going to spoil plans of the people I love. This is a busy week for my family, but I cannot pick when she will come. As long as the boys are taken care of and Muscle Man is with me all will be fine. I am a planner so this all stresses me out. I am hoping that the next post will have pictures of our newest addition!! Thank you for your well wishes and positive vibes. 38 Weeks 2 days along in our journey, +-12 days to go! While I want her to be fully developed, we are ready at any time. With several Braxton Hicks, and some strange semi-painful contractions yesterday, things are progressing for sure. My energy level is low and I feel pretty crappy most days. This last stretch is tough, but I am trying to cherish it since this will be my last time pregnant. 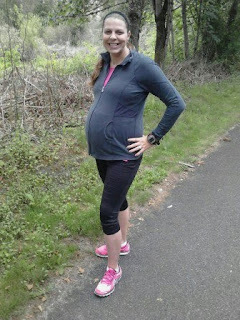 I have already started to search for post-baby 5K’s. I would like to have the option to push her, so looking for smaller races close to home. Getting back to running and racing is going to be all about priorities!! With 2 kids in school and a newborn I will not be adding any Marathons to my schedule anytime soon. I look forward to getting back to jogging/running, I really love covering more ground in a faster time. Walking is nice and I have enjoyed the extra time chatting with the boys, so may have a mix of different workouts. That is all I have for now, will keep you posted on the arrival of Baby Q!! Miles Walked Pregnant: 168.3, getting in 6 miles a week has been tough, it has been hot and she is pushing on my bladder. Weight Gained: 32 pounds, get weighed again today. I had a weird weight gain last week, guessing it was due to water retention because the temperature increased and I was drinking a ton of water. Current Aversion: Smelly things that people cook in the work microwave, GROSS!! Baby Likes: Baby girl moves after I have had a big meal. Had a small bowl of Lucky Charms the other night and she went CRAZY for like 30 minutes, my belly was ROLLING. Baby Dislikes: Sitting in the car, she does not like being cramped. Excitement: I have decided to make this Friday my last day at work, although she is not due until July 22nd I am not feeling well and would like to spend the time with my boys. Gripes: Unsolicited opinions, I am too hormonal to hear it. I will do what is best for me and my baby PERIOD! Swollen feet are sore, but this is not every day so I should not complain. Insomnia is setting in, but I think that will subside when work stress is over. Purchases: We bought a used once Baby Trend Double Jogging Stroller off craigslist for $90 and an almost new Baby Trend Single Jogging stroller for $20 at a Garage Sale. 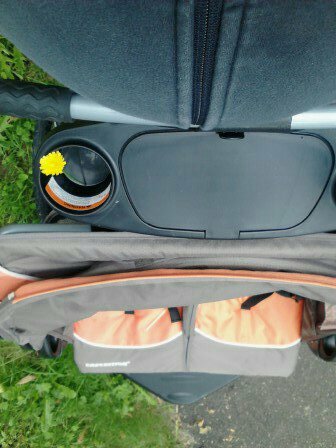 The single works with our infant car seat. $110 for 2 Jogging strollers that will give us miles and miles, I could not be more thrilled!! This was take week 37 I think? 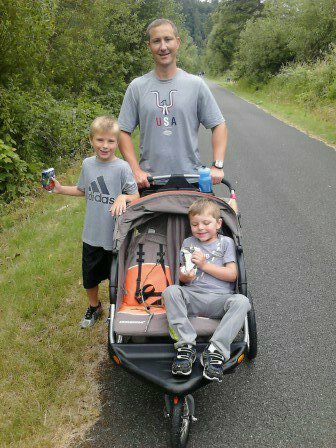 We know LS#2 is too big for this stroller, but oh well we will make due. I had an AMAZING baby shower in Mid-May. Here are some of the highlights. Included are photos of all the women I have met through Blogging, Friends and Family also attended. Yes we are cheeseballs- but that is the FUN part!! We have EVERYTHING we need, her closet is FULL and I am BLESSED!